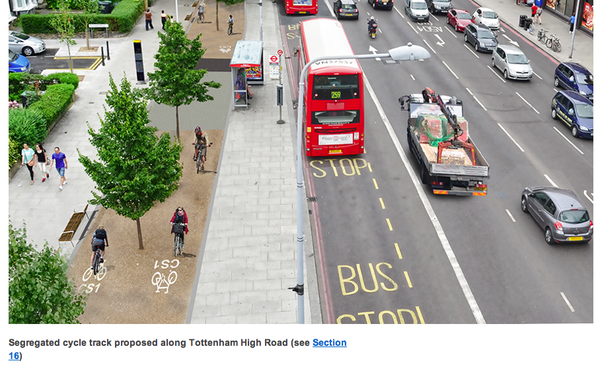 Transport for London is currently consulting on its plans for Cycle Superhighway 1 (CS1), which would run from White Hart Lane in Tottenham to Liverpool Street station, forming part of the London-wide network of Cycle Superhighways. There's been much debate about whether or not the route should be called a 'Superhighway'. Rather than following main roads, as the majority of Cycle Superhighways do, Cycle Superhighway 1 is planned to run primarily on residential roads running to the west of the A10. Segregated cycle tracks would only be used on a few sections where the route passes along busy roads. At the south end it would start at the Sun Street/Wilson Street junction, and follow Paul Street to Old Street (pictured above). Pitfield Street is to be closed to through motor traffic and the roundabout at New North Road and Pitfield Street removed. Under the current proposals route would follow De Beauvoir and Culford Rds north, then follow Balls Pond Rd for a short segment. Transport for London are consulting on two options for this busy stretch of road - Option A offering advisory cycle lanes in both directions, and option B offering segregated two-way cycle track. North of Balls Pond Rd the route would follow Kingsbury Rd, Boleyn Rd, Wordsworth Rd and Defoe Rd, parallel to Stoke Newington High Street. The route would continue north on residential roads along Bouverie and Heathland Rd. Between here and the High Rd (the A10), Transport for London are reviewing different alignments and have said they welcome views. At South Tottenham segregated two way cycle track within the footway would follow the A10 until just north of Seven Sisters, when the track would return to the carriageway and follow Philip Lane, Napier Rd, Broadwater Rd and Church Lane/Church Rd, finishing at White Hart Lane. Haringey Cycling Campaign have published their initial thoughts on this section of the route, highlighting concerns including the risk of conflict with pedestrians and the width of the track at places on the High Rd, and concerns with the alignment along the busy Philip Lane. LCC is working on its response to the proposals in full, in collaboration with our Infrastructure Review Group and local groups in Hackney, Islington and Haringey and will publish our response on the website before the end of the consultation. The deadline is 29th March. Transport for London are holding events for the public to speak to their team about the plans at Stamford Hill Library, 120 Stamford Hill, London, N16 6QT on Monday 9 March from 15:00-19:30 and at Marcus Garvey Library, Tottenham Green Centre, 1 Philip Lane, London, N15 4JA on Saturday 14 March from 11:00-16:00. You can respond to the consultation through their online survey, or by emailing consultations@tfl.gov.uk. Andrew Gilligan, the Mayor's Cycling Commissioner, will be cycling the route with local campaigning group Hackney People on Bikes, starting at the junction of Sun Street and Wilson Street in the City at 17:00 hours, on Tuesday 17 March 2015. Download LCC's response to the consultation.